City Index dates back to 1983 when it began operation as one of the first spread betting companies in the United Kingdom. In 2001, it started offering Contracts for Difference to clients, and in 2005, City Index acquired spread betting competitor Finspreads that had been active online since 1999. From a regulatory perspective, City Index’s parent GAIN Capital is regulated in the United States by the CFTC and NFA, in Japan by the FSA, in Canada by the IIRO, in the UK by the FCA, in Hong Kong by the SFC, in Singapore by the MAS, in the Cayman Islands by CIMA and in Australia by ASIC. City Index has its head office in London, England and is authorized and regulated by the UK’s FCA under the authorization number 113942. City Index currently offers clients the opportunity to trade in more than 12,000 markets, which include forex currency pairs, various commodities, indexes and individual stocks. In terms of size, GAIN Capital’s trading related businesses that include City Index average $501.2 billion in trading volume per month, have 140,000 retail clients situated in 180 countries, and employ roughly 800 staff on four continents. 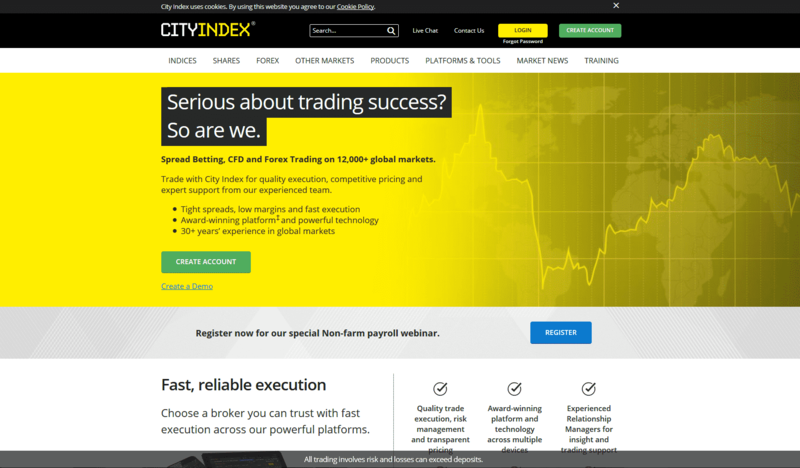 City Index features firm financial backing from its parent GAIN Capital, and offers competitive pricing and a competent trade execution service in a very wide range of trading instruments using its award-winning trade platforms, which include MetaTrader 4. 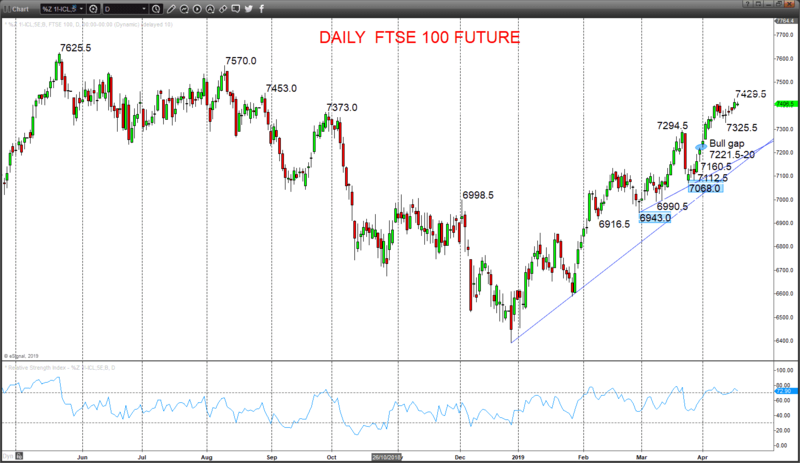 21 Indexes – Indexes with names like the UK 100, Wall Street, Australia 200 and Germany 30, in addition to futures and options on these indexes. 4,500 Global Stocks – Shares of major firms like Deutsche Bank, Amazon, Apple, Rio Tinto and Barclays. 84 Forex Pairs – All of the major and minor currency pairs, in addition to quite a few exotic pairs can be traded by City Index clients. 25+ Key Commodities – Futures contracts on commodities like grains, cattle, energy, cocoa, cotton and other soft commodities. Other Financial Markets – Precious metals like gold, silver, platinum, palladium and copper; U.S., Eurozone and UK bonds; interest rates like LIBOR, Euribor and Short Sterling, in addition to many options contracts on financial assets. The company offers spread betting and CFD trading accounts to its clients, as well as a forex trading account for those wishing to use MT4. You can also open up a demo account at City Index to test out their services. Advantage Web – this is a very customizable Web trading platform that won an award from ADVFN in 2017 for being the “Best Spread Betting platform”. The platform is straightforward to operate and offers twelve useful chart types and more than 80 technical indicators. In addition, it provides a Reuters news feed and a research portal with trading ideas that utilize both fundamental and technical analysis. 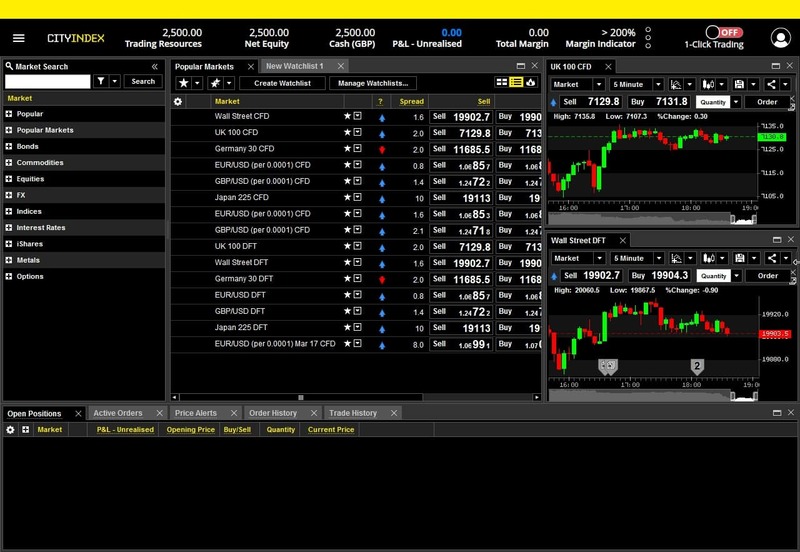 AT Pro – this platform was intended for professional traders and offers advanced functions and a customizable interface. AT Pro lets users create their own templates using .NET, C# and Visual Basic programming languages, in addition to letting them select from various existing templates. The platform also offers charts that can be augmented with more than 100 indicators, as well as a back-testing tool that works with Excel to help traders analyze the success of their trade plan using historical data. The software also provides some useful trading strategy system choices like a moving average crossover system, an MACD line crossover system, and the Heikin-Ashi reversal system that uses candlesticks. MT4 Trading Platform – traders who enjoy using the ever-popular MT4 platform are supported by City Index, which combines its numerous trading tools with competitive variable dealing spreads. The standard platform has customizable indicators, advanced charting features and its Expert Advisor capability that lets you automate your own trading strategies or use an off the shelf trade signal or trading robot package. The screenshot below demonstrates the functionality of City Index’s proprietary Advantage Web platform, which lets you monitor your account and offers support for technical and fundamental analysis. Both Advantage Web and AT Pro provide users with a very valuable Reuters news feed for high quality financial news and prompt economic data release announcements. Also, the City Index allows you to trade on the go with their mobile trading platform that has apps suitable for both Android and iOS Apple mobile devices. To open an account with City Index, you will need a £100 minimum initial deposit or enough to cover your first trade’s margin requirement. You can deposit funds into trading accounts via Visa, MasterCard, Maestro or Electron debit cards, a MasterCard or Visa credit card, or by using a bank wire transfer. To withdraw funds, you must take out a minimum of £50 or the full account balance if less than £50. The maximum amount you can withdraw is £20,000, with an additional limit of £20,000 per day if you are using a credit card to withdraw funds to. Only withdrawals via a CHAPS payment incur a fee, which costs £25 when such payments are less than £5,000. A withdrawal from City Index can take anywhere from three to five business days, and bank wire transfers typically complete within one to two business days. Some banks that subscribe to services that permit faster payments can complete a withdrawal within one business day. City Index offers a helpful customer support service that is available 24/5 via phone and e-mail, as well as via a live online chat with a support agent that can be accessed from their website. Their customer support service is available in many languages for the convenience of City Index’s global client base. In addition, City Index offers extensive and varied forms of educational support for traders who are new to the forex market in its Trading Academy. 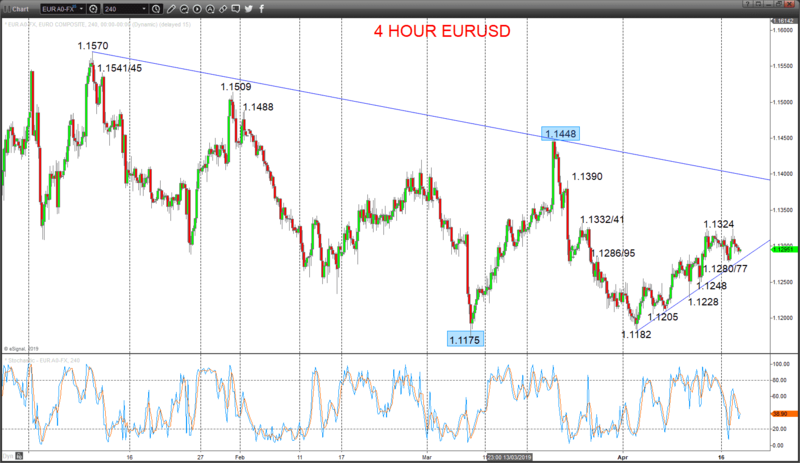 These training materials include video trading tutorials, webinars, help and support pages, and trading tips. City Index was one of the original participants in the spread betting business with over 34 years of experience. The well-regulated and backed firm also offers a complete online brokerage service in a wide variety of CFDs and forex currency pairs. This broker also supports the popular MT4 platform, and its proprietary trading platforms are comprehensive, straightforward to use, and available in web and mobile formats. City Index also offers tight variable trading spreads, access to the Reuters news feed, a competent customer support service and training materials. Overall, City Index is both a viable and reputable firm for traders of any skill level to consider as a trading partner.